Whether you run a large corporation or own a small mom-and-pop shop, having a style guide is a key to business success. It acts as your company's style bible, creating a cohesive identity that guarantees a consistent look and feel for your brand as you create new marketing materials. What's In A Style Guide? A style guide, also known as an identity guide, sets out the design specifications for the conveyance of your company's overall brand appearance and messaging. You can include every attribute that's important to the integrity of your brand. 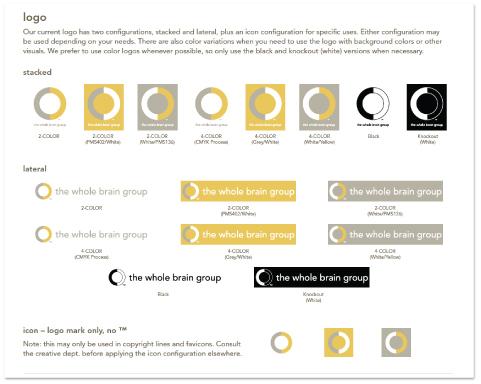 Logo - description, font types, colors, and configuration. Logo - appropriate use on websites, publications, and other documents. Specified typography, approved weights, headers, subheads, body copy, and lists. Definitive patterns or graphic elements. Specific iconography and its appropriate use. Tone of voice, tag lines, keyword usage, etc. Do You Have A Style Guide? If you don't, get started on one today! It will help you save time and money in the long run. Make sure that your style guide is well-documented and easily accessible to all members of your organization. Introducing a style guide will not only enforce consistent branding throughout the company, it will also help you maintain the integrity of your brand as your business grows and evolves. Your sales and marketing team will certainly thank you for making their job easier!